The first comprehensive anthology of one of the original legendary rockabilly stars! Includes the previously unissued complete version of ''Let's Get Wild'', plus four other unreleased recordings. Includes the original hit version of ''Duck Tail'' now a rockabilly classic! 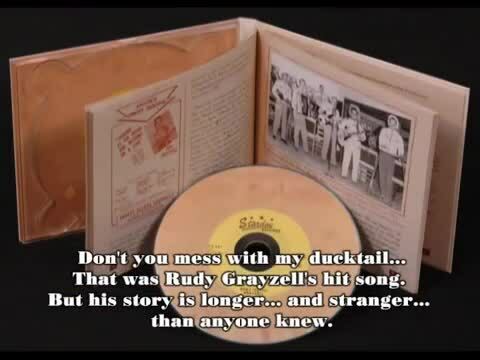 Rudy's story is told in extensive liner notes ''Don't You Mess With My Ducktail''. That was Rudy Grayzell's hit song. But his story is longer and stranger than anyone knew. His first record, ''Looking At The Moon'' and ''Wishing On A Star'', was a big hit in 1953, and one year later he recorded the first cover version of ''Hearts Of Stone''. After that, he joined the legendary Starday label to record ''Duck Tail'', ''Let's Get Wild'', and several other classics. And then he was on the legendary Sun label for one single. In the interviews accompanying this set, Rudy talks about performing ''Duck Tail'' naked in a graveyard for several drunken women, and talks about his many marriages, his brushes with Elvis Presley (Elvis gave him the nickname Rudy Tutti), making love to a woman during a tornado, playing with Doug Sahm when Sahm was nine years old, and much else. Among his other accomplishments, Rudy was the first Hispanic rock and roller; he was born Rudolfo Jiminez in south Texas. This set includes his complete recordings for Abbott, Capitol, Starday, Sun, and Award. It all adds up to the last word on one of the first names in rockabilly.